As with incomes, relative mobility in the wealth distribution is also somewhat discouraging. The class you were born into is pretty “sticky,” especially if you were very poor or very rich. 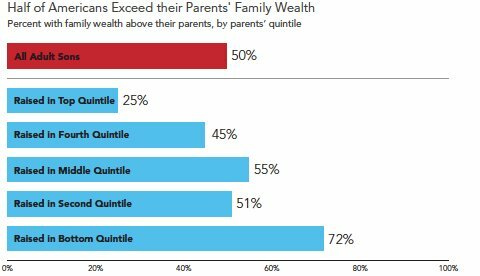 Of Americans born into the bottom quintile of wealth, 41% remain there in adulthood, double the share you would expect if wealth were randomly assigned. 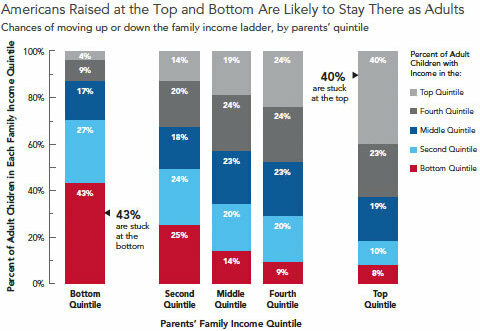 Likewise, 41% of Americans born into the top quintile of wealth remain there as adults. 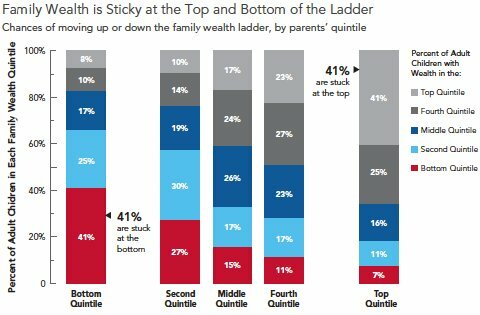 Just 7% of the richest Americans topple all the way to the bottom. 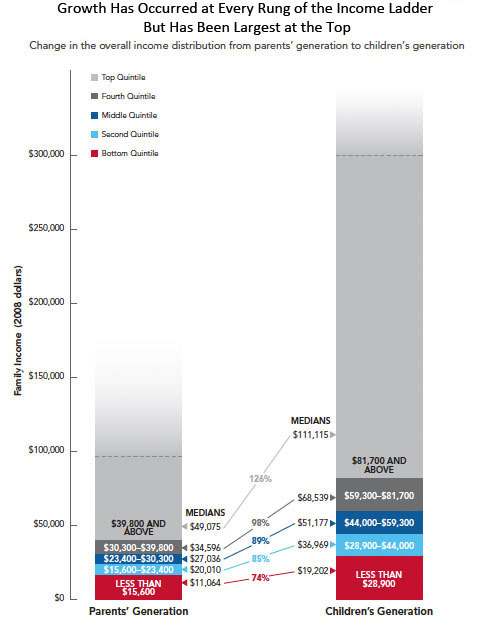 [T]he typical American in each income quintile earned more than his counterpart from a generation earlier. The median person in the panel today earns a family income of $51,177, whereas the comparable figure from a generation ago was $27,036 after adjusting for inflation. 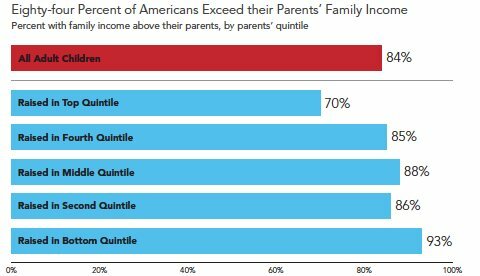 You can see similar bumps upward for the typical family in other quintiles, and that the very highest earners got the biggest raises. 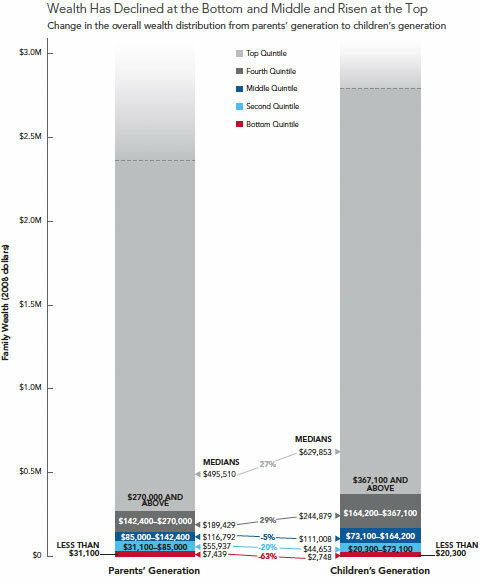 The median family in the top quintile earned $49,075 a generation ago, and $111,115 today, an increase of 126% in inflation-adjusted terms. That’s a much bigger raise, no doubt, but at least every income strata saw its earnings rise. The trend for the distribution of wealth looks somewhat different. Unlike with income, there were not across-the-board gains for wealth. The median person in the poorest quintile has a family net worth that is 63% less than that of his counterpart a generation ago: $2,748, versus $7,439. How much of this is just a shift to two earner households? Supposedly, real median male wages haven't increased at all. Paul, aren't you overdoing it with all these articles from left-wing The NY Times? It would be interesting to see how the increase in income vs the decrease in the value of a dollar. Wouldn't it be fascinating to know if the European "social democracies", using the same methodology, have more or less income and wealth mobility? Are these figures in constant dollars (i.e., adjusted for inflation)? If not, they are meaningless. This entire article is nothing but air. When I was a kid in the 1950s we got 5 loaves of bread for a dollar. Now its what $3.50 a loaf? When I got my first real job in 1973 my mother me told I was earning more than my father ever did. When my son got his first job, Electrical Engineer, he is making TWICE my high pay after 30 years on the union scale job.